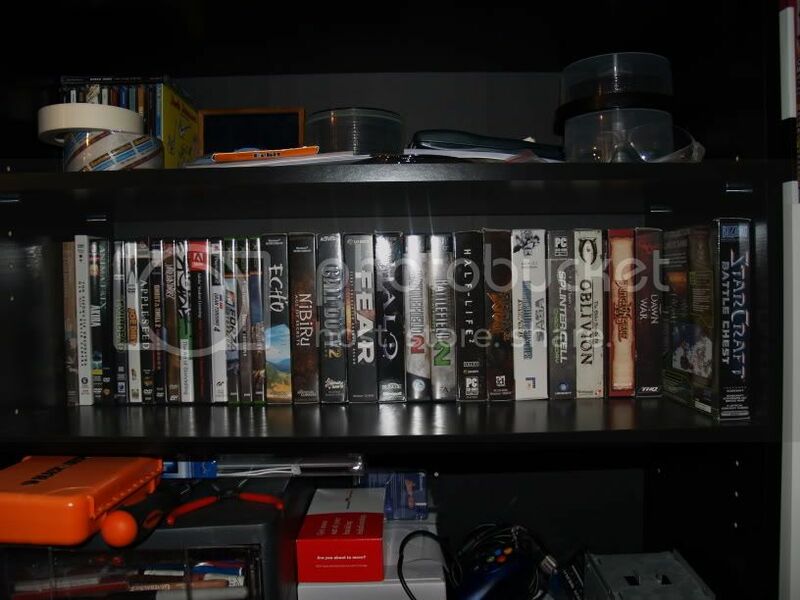 Here are my PC games. I thought it would be interesting to see others collections. AMD Athlon 64 X2 4400+ / DFI Lanparty UT NF4 SLI-DR Expert NVIDIA Socket 939 / FX GeForce 7800 GT 256MB GDDR3 / 2x1GB of G.Skill PC4000 DDR500 3.5.5.10 F1-4000USU2 / 19" Kingston LCD / 550 W ULTRA X-2 PSU / JBL 5.1 / PS CS2.0 / 120 G 7200RPM I also have an Olympus Evolt E-500 digital camera and 9" WS portable DVD player. Haha, I would like to show you my collection, but I don't have the boxes to prove that I bought them. Most of my games were obtained...differently. Hmm...I guess I'll do what Lac3y did and just list my games. Those are the full games that a currently have, not including demos. Huh? What's the link for?